The Inventions, Researches and Writings of Nikola Tesla- by Thomas Commerford Martin, Editor - PART IV: Early phase motors and the Tesla mechanical and electrical oscilations - Chapter XLIII: The Tesla Mechanical and Electrical Oscillators. On the evening of Friday, August 25, 1893, Mr. Tesla delivered a lecture on his mechanical and electrical oscillators, before the members of the Electrical Congress, in the hall adjoining the Agricultural Building, at the World's Fair, Chicago. Besides the apparatus in the room, he employed an air compressor, which was driven by an electric motor. Mr. Tesla was introduced by Dr. Elisha Gray, and began by stating that the problem he had set out to solve was to construct, first, a mechanism which would produce oscillations of a perfectly constant period independent of the pressure of steam or air applied, within the widest limits, and also independent of frictional losses and load. Secondly, to produce electric currents of a perfectly constant period independently of the working conditions, and to produce these currents with mechanism which should be reliable and positive in its action without resorting to spark gaps and breaks. This he successfully accomplished in his apparatus, and with this apparatus, now, scientific men will be provided with the necessaries for carrying on investigations with alternating currents with great precision. These two inventions Mr. Tesla called, quite appropriately, a mechanical and an electrical oscillator, respectively. The former is substantially constructed in the following way. There is a piston in a cylinder made to reciprocate automatically by proper dispositions of parts, similar to a reciprocating tool. Mr. Tesla pointed out that he had done a great deal of work in perfecting his apparatus so that it would work efficiently at such high frequency of reciprocation as he contemplated, but he did not dwell on the many difficulties encountered. He exhibited, however, the pieces of a steel arbor which had been actually torn apart while vibrating against a minute air cushion. or else he obtains the spring within the chambers of the oscillator itself. To appreciate the beauty of this it is only necessary to say that in that disposition, as he showed it, no matter what the rigidity of the spring and no matter what the weight of the moving parts, in other words, no matter what the period of vibrations, the vibrations of the spring are always isochronous with the applied pressure. Owing to this, the results obtained with these vibrations are truly wonderful. Mr. Tesla provides for an air spring of tremendous rigidity, and he is enabled to vibrate big weights at an enormous rate, considering the inertia, owing to the recoil of the spring. Thus, for instance, in one of these experiments, he vibrates a weight of approximately 20 pounds at the rate of about 80 per second and with a stroke of about 7/8 inch, but by shortening the stroke the weight could be vibrated many hundred times, and has been, in other experiments. To start the vibrations, a powerful blow is struck, but the adjustment can be so made that only a minute effort is required to start, and, even without any special provision it will start by merely turning on the pressure suddenly. The vibration being, of course, isochronous, any change of pressure merely produces a shortening or lengthening of the stroke. Mr. Tesla showed a number of very clear drawings, illustrating the construction of the apparatus from which its working was plainly discernible. Special provisions are made so as to equalize the pressure within the dash pot and the outer atmosphere. For this purpose the inside chambers of the dash pot are arranged to communicate with the outer atmosphere so that no matter how the temperature of the enclosed air might vary, it still retains the same mean density as the outer atmosphere, and by this means a spring of constant rigidity is obtained. Now, of course, the pressure of the atmosphere may vary, and this would vary the rigidity of the spring, and consequently the period of vibration, and this feature constitutes one of the great beauties of the apparatus; for, as Mr. Tesla pointed out, this mechanical system acts exactly like a string tightly stretched between two points, and with fixed nodes, so that slight changes of the tension do not in the least alter the period of oscillation. practice by combining an electric generator with his oscillator. He pointed out what conditions must be observed in order that the period of vibration of the electrical system might not disturb the mechanical oscillation in such a way as to alter the periodicity, but merely to shorten the stroke. He combines a condenser with a self-induction, and gives to the electrical system the same period as that at which the machine itself oscillates, so that both together then fall in step and electrical and mechanical resonance is obtained, and maintained absolutely unvaried. Next he showed a model of a motor with delicate wheelwork, which was driven by these currents at a constant speed, no matter what the air pressure applied was, so that this motor could be employed as a clock. He also showed a clock so constructed that it could be attached to one of the oscillators, and would keep absolutely correct time. Another curious and interesting feature which Mr. Tesla pointed out was that, instead of controlling the motion of the reciprocating piston by means of a spring, so as to obtain isochronous vibration, he was actually able to control the mechanical motion by the natural vibration of the electro-magnetic system, and he said that the case was a very simple one, and was quite analogous to that of a pendulum. Thus, supposing we had a pendulum of great weight, preferably, which would be maintained in vibration by force, periodically applied; now that force, no matter how it might vary, although it would oscillate the pendulum, would have no control over its period. maximum current flowing in the conductor; then this current will, according to Lenz's law, drive the conductor out of the field again, and if the conductor has no resistance, then it would leave the field with the velocity it entered it. Now it is clear that if, instead of simply depending on the current to drive the conductor out of the field, the mechanically applied force is so timed that it helps the conductor to get out of the field, then it might leave the field with higher velocity than it entered it, and thus one impulse is made to preponderate in e. m. f. over the other. With a current of this nature, Mr. Tesla energized magnets strongly, and performed many interesting experiments bearing out the fact that one of the current impulses preponderates. Among them was one in which he attached to his oscillator a ring magnet with a small air gap between the poles. This magnet was oscillated up and down 80 times a second. A copper disc, when inserted within the air gap of the ring magnet, was brought into rapid rotation. Mr. Tesla remarked that this experiment also seemed to demonstrate that the lines of flow of current through a metallic mass are disturbed by the presence of a magnet in a manner quite independently of the so-called Hall effect. He showed also a very interesting method of making a connection with the oscillating magnet. This was accomplished by attaching to the magnet small insulated steel rods, and connecting to these rods the ends of the energizing coil. As the magnet was vibrated, stationary nodes were produced in the steel rods, and at these points the terminals of a direct current source were attached. 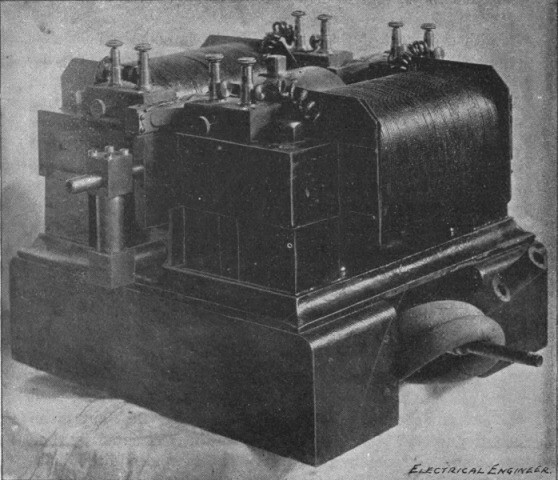 Mr. Tesla also pointed out that one of the uses of currents, such as those produced in his apparatus, would be to select any given one of a number of devices connected to the same circuit by picking out the vibration by resonance. There is indeed little doubt that with Mr. Tesla's devices, harmonic and synchronous telegraphy will receive a fresh impetus, and vast possibilities are again opened up. Mr. Tesla was very much elated over his latest achievements, and said that he hoped that in the hands of practical, as well as scientific men, the devices described by him would yield important results. He laid special stress on the facility now afforded for investigating the effect of mechanical vibration in all directions, and also showed that he had observed a number of facts in connection with iron cores. which passes through fitting boxes at the end of the cylinder C. The boxes project to a carefully determined distance into the hollow of the cylinder C, thus determining the length of the stroke. Surrounding the whole is a jacket J. This jacket acts chiefly to diminish the sound produced by the oscillator and as a jacket when the oscillator is driven by steam, in which case a somewhat different arrangement of the magnets is employed. The apparatus here illustrated was intended for demonstration purposes, air being used as most convenient for this purpose. A magnetic frame M M is fastened so as to closely surround the oscillator and is provided with energizing coils which establish two strong magnetic fields on opposite sides. The magnetic frame is made up of thin sheet iron. In the intensely concentrated field thus produced, there are arranged two pairs of coils H H supported in metallic frames which are screwed on the shaft A of the piston and have additional bearings in the boxes B B on each side. The whole is mounted on a metallic base resting on two wooden blocks. ends protruding from the boxes B. 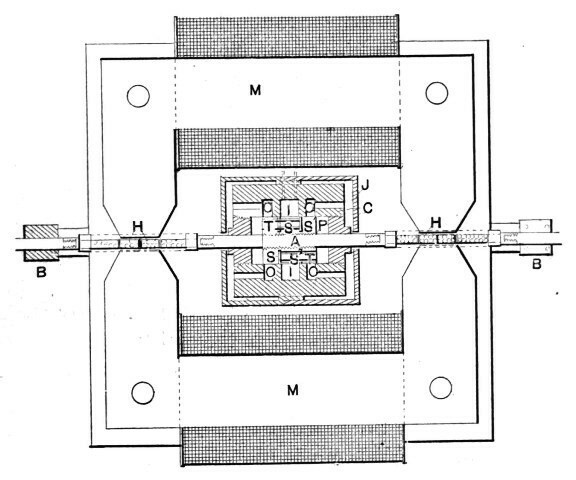 Assume that the motion imparted be such as to move the piston to the left (when looking at the diagram) then the air rushes through the slot S' and tube T into the chamber to the left. The pressure now drives the piston towards the right and, owing to its inertia, it overshoots the position of equilibrium and allows the air to rush through the slot S and tube T into the chamber to the right, while the communication to the left hand chamber is cut off, the air of the latter chamber escaping through the outlet O on the left. On the return stroke a similar operation takes place on the right hand side. This oscillation is maintained continuously and the apparatus performs vibrations from a scarcely perceptible quiver amounting to no more than 1 of an inch, up to vibrations of a little over 3/8 of an inch, according to the air pressure and load. It is indeed interesting to see how an incandescent lamp is kept burning with the apparatus showing a scarcely perceptible quiver. To perfect the mechanical part of the apparatus so that oscillations are maintained economically was one thing, and Mr. Tesla hinted in his lecture at the great difficulties he had first encountered to accomplish this. But to produce oscillations which would be of constant period was another task of no mean proportions. As already pointed out, Mr. Tesla obtains the constancy of period in three distinct ways. Thus, he provides properly calculated chambers, as in the case illustrated, in the oscillator itself; or he associates with the oscillator an air spring of constant resilience. But the most interesting of all, perhaps, is the maintenance of the constancy of oscillation by the reaction of the electromagnetic part of the combination. Mr. Tesla winds his coils, by preference, for high tension and associates with them a condenser, making the natural period of the combination fairly approximating to the average period at which the piston would oscillate without any particular provision being made for the constancy of period under varying pressure and load. As the piston with the coils is perfectly free to move, it is extremely susceptible to the influence of the natural vibration set up in the circuits of the coils H H. The mechanical efficiency of the apparatus is very high owing to the fact that friction is reduced to a minimum and the weights which are moved are small; the output of the oscillator is therefore a very large one. direction before. No doubt many inventors, at one time or other, have entertained the idea of generating currents by attaching a coil or a magnetic core to the piston of a steam engine, or generating currents by the vibrations of a tuning fork, or similar devices, but the disadvantages of such arrangements from an engineering standpoint must be obvious. Mr. Tesla, however, in the introductory remarks of his lecture, pointed out how by a series of conclusions he was driven to take up this new line of work by the necessity of producing currents of constant period and as a result of his endeavors to maintain electrical oscillation in the most simple and economical manner.